Over the last few years, the Marvel Universe has proven to be an incredibly lucrative platform from which superheroes and comic book action have been brought to life. So it was no surprise to fans when Netflix announced that they were in the midst of creating a web-based series chronicling the life of the blind vigilante, Daredevil. By combining hard-hitting action with angst-ridden character backstory, Daredevil perfectly encapsulates Marvel’s foray into the world of the tortured superhero, and makes it possible for even a comic book novice to enjoy the ride. The much-anticipated first season premiered on April 10 with thirteen, hour-long episodes. 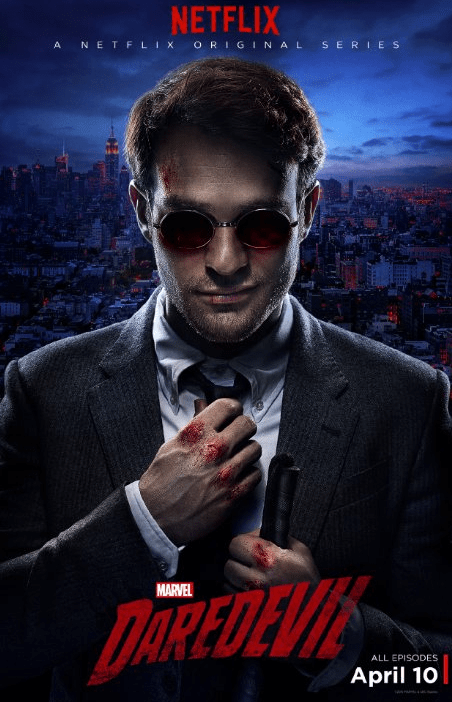 Created by Drew Goddard, the show stars Charlie Cox as Matt Murdock, Elden Hensen as Franklin “Foggy” Nelson and Deborah Ann Woll as Karen Page with Vincent D’Onofrio rounding out the main cast as Wilson Fisk. The series begins by giving the audience a glimpse into Matt Murdock’s past. Blinded at nine years old by a chemical accident, Murdock learns to cope with his newfound impairment by honing all his other senses to almost superhuman levels. Undeterred by his blindness, Murdock excels in school, becomes a hit with the ladies and eventually meets his best friend, Foggy, in law school with the two later starting a fledgling law firm and eventually acquiring Karen Page as an assistant. It is during his adult life that Murdock starts to don a black ensemble (pre-iconic devil horn costume) to fight crime as he senses it occurring. This dichotomy is interesting to see played out on screen as Murdock holds tight to the law, while at the same time taking it into his own hands when not in the courtroom. The action takes place on the streets of Hell’s Kitchen in a post-Avengers New York City. Murdock snuffs out drug dealers and other baddies, initially unaware that pretty much every dirty dealing is tied to one man: Wilson Fisk. Luckily for Murdock, Ben Urich (Vondie Curtis-Hall), a reporter for the fictional New York Bulletin, is working on an article that he hopes will expose Fisk and his hostile takeover of the neighborhood. Karen Page aids Urich in his research, leading the twosome down some dark paths. Wilson Fisk is not introduced until the third episode, but his presence is felt long before that. A hulking, bald, behemoth of a man, Fisk rules his empire with the help of a diligent sidekick, James Wesley (Toby Leonard Moore), and an iron fist. Prone to bouts of intense anger, Fisk can be seen carrying out ruthless acts of violence against any that defy him. In fact, it is violence that ties much of the show together. Arguably one of the darkest Marvel productions yet, Netflix was able to give Daredevil the authentic urban grittiness it so deserved. Fortunately, the fight scenes are interspersed well enough so that they are not gratuitous but actually helpful to the continuity of the Daredevil/Fisk plot line. While satisfying the brutality element of the show, Goddard also made sure to include some romance. Murdock has a brief fling with Claire Temple (Rosario Dawson), a nurse who rescues him from a dumpster and occasionally stitches him up after his fights with Fisk’s goons. There is also potential of a spark between Foggy and Karen. And finally, Wilson Fisk becomes enamored early on with an art gallery owner, Vanessa Marianna (Ayelet Zurer), who proves a perfect counterbalance to his fiery temper. During the course of the series, Murdock tries to expose Fisk by going through the various channels of his crime syndicate both in and out of costume. It is this identity overlap that leads to many of the cliffhangers and revelations in Murdock’s quest for justice. Indeed, much of the series hinges on whether or not Murdock will be discovered; one of the most commonly used superhero clichés of all time. The concept of maintaining a secret identity has been done pretty much since the time of the O.G. superhero, and while it still proves useful for creating drama, a part of me wondered why Murdock couldn’t come clean to his friends. They were, after all, like family. Ultimately the first season of Daredevil proves itself to be more than just a flash in the pan. Matt Murdock is a brooding badass, and an easy pick for the audience to root for (even when he may go over the edge.) We want to see him succeed as “the man without fear,” but also find happiness, however impossible that may seem. But with a second season already secured, as well as a potential leap into the Marvel Cinematic Universe, Daredevil doesn’t look to be slowing down anytime soon.